Researchers at the Ångström Laboratory, are working on a way towards enhancing RF amplifiers to make them more affordable, efficient and accessible for medical applications like cancer diagnosis. With the upgraded technology, the cost of maintenance and operation of these amplifiers can be reduced significantly. This research is being carried out under the EU project ENEFRF. Dragos Dancila at the Division of Solid State Electronics and FREIA is heading the Eurostars project ENEFRF. The plan is to develop radio-frequency amplifiers for new cyclotrons in collaboration with GE Healthcare in Uppsala. Particle accelerators like cyclotrons are used to produce radio isotopes. These are then used as markers in positron emission tomography, PET, scans, to track and identify tumors in patients. However, the electron tube technology used today relies on a single element, which is problematic in terms of reliability, states Dragos Dancila. If this component fails, it takes a long time to restore operations. But if instead more components are used in the form of several dozen high power transistors, it will be easier to replace any single component, and in this way maintain radioisotope production. Another advantage is that transistors with lower voltage levels can also be handled by staff without specialist knowledge. The result of the project is also more affordable cyclotrons which can even be dispatched to remote areas, according to Dragos Dancila. This enables to set up several cyclotrons near very many patients at different hospitals, instead of just having a single centralized cyclotron. The RF amplifiers that he and his research colleagues are developing at the Ångström Laboratory will be powered by transistors with ten times higher density than what is available today. They will however need to increase power levels. At the moment, they are developing power amplifiers based on semiconductor technology for different frequencies and working on improving efficiency. The challenge is to reach high enough voltage levels and get the amplifiers to work with at high efficiencies in a reliable way. 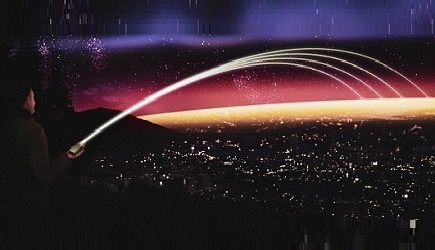 In the future, these kind of high-performance microwave sources will also be critical for the operation of research facilities such as ESS in Lund. The project ENEFRF stands for Energy Efficient Positron Emission Tomography (PET) Cancer Diagnostics-Novel RF Source for Radioisotope Production. 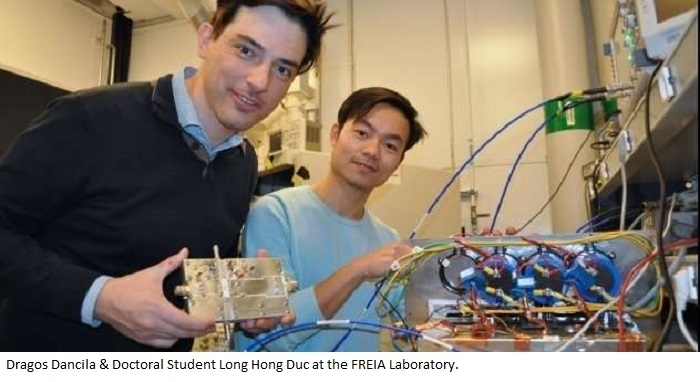 The objective of the project team at the FREIA laboratory is to achieve more than 1 kW per transistor amplifier with approximately 80 percent efficiency. The continuous improvement of the transistors will allow the substitution of electron tube technology in the frequency range from 100-2000 MHz.